Wood crates and boxes are everywhere. From thrift stores to antique shops to craft stores and Home Depot, they are a DIY’ers best fast project supply item. So many cool things can be made from these geometric cubes, and it doesn’t take an advanced woodworking skill to pull together these great DIY wood projects. (Lets face it, most of the building is already done when you use crates!) Organize with them, display with them, and make life simpler with them. Just make something with them! These DIY wood crate tutorials will get you there. You’re welcome. First of all we have this wood crate rolling cart from Gina at ‘Shabby Creek Cottage‘. This is such a versatile piece of furniture… And it only took her 20 minutes to make! Fast DIY wood crate project, AND easy to follow tutorial. Amy at ‘Positively Splendid‘ has made sure her kids have the best toys ever… books! 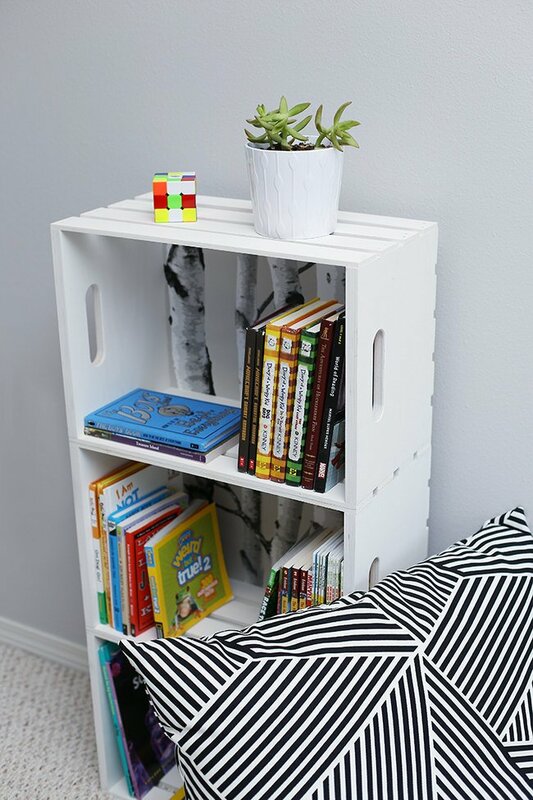 This DIY wooden crate bookshelf is colorful and simple, but make sure to go through and see how sweet this looks in her kids’ bedroom. Make sure to heed her advice about anchoring the wood crates to the wall as well! 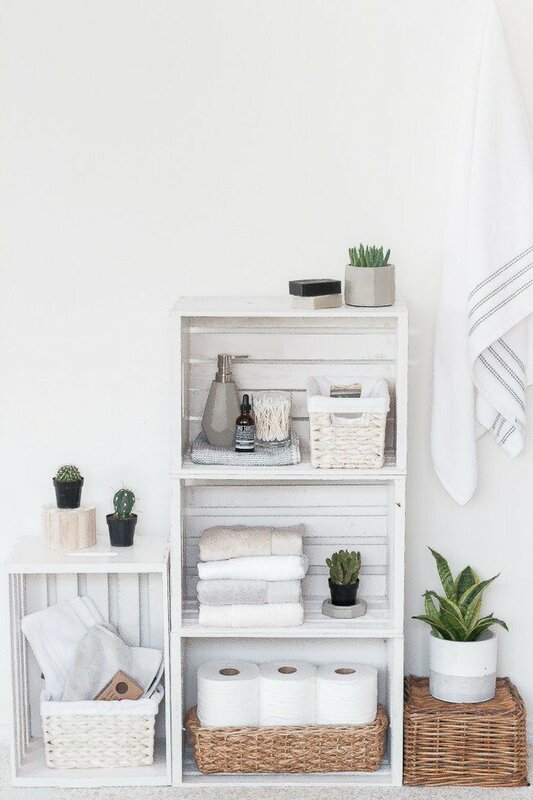 Andrea at ‘The Beauty Dojo‘ used her wood crates to make this DIY crate shelf bathroom organizer. Loving’ on this! So simple, yet so charming! And storage? Yes! From Faith at ‘Curbly‘, this colorful DIY wood crate cart is really cool… Another easy one, and we really like the chalkboard labels! This would be great in a kids room too. 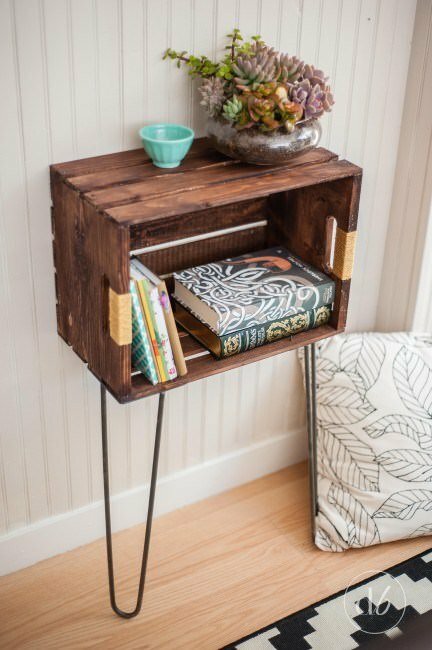 She used old wine crates, which gave it great character, but you could use plain crates too. 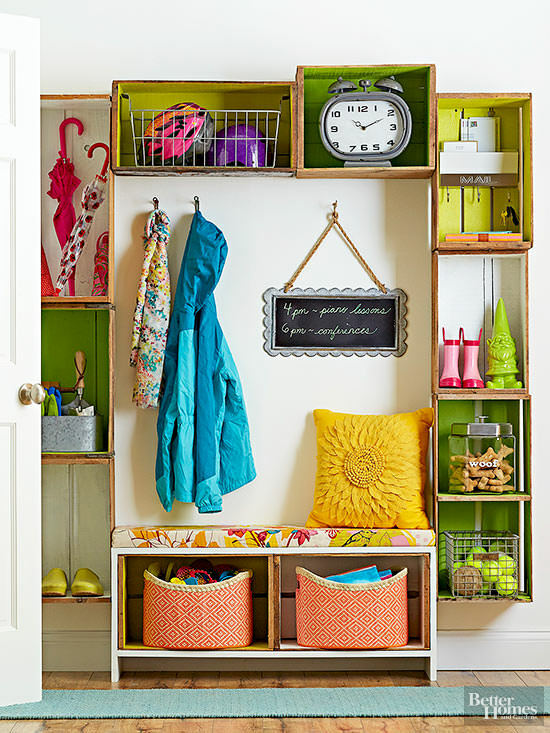 From ‘BHG‘, this wood crate entryway organizer is easy, colorful , and really, really useful. They even have a video on how to get this done! 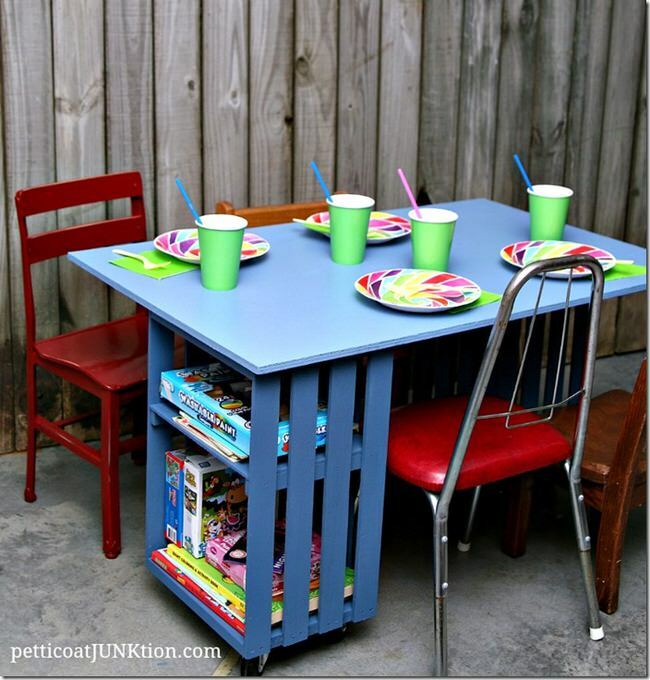 Kathy at ‘Petticoat Junktion‘ created this kids’ wooden crate table workstation from two crates and a sheet of plywood. Lots of storage, and a desktop space. 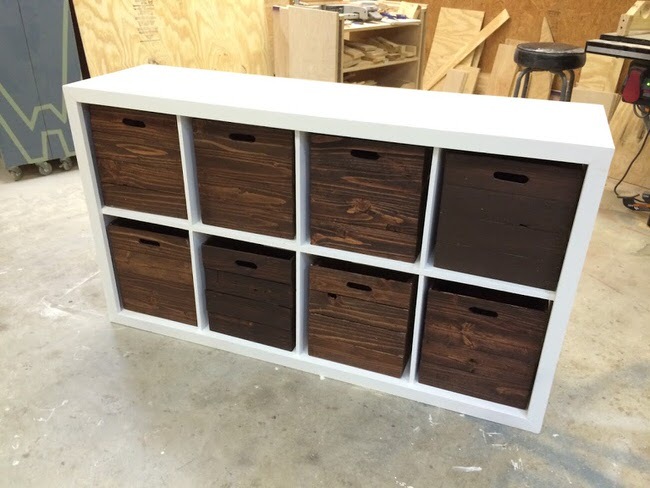 This storage unit with DIY wood crates is from ‘Ana White‘. They used this piece as toy storage (genius!) but I could see it as a sideboard in a dining space, craft room storage, or even as a dresser! What would you use it for? Ok. My summer picnics just got amazing. 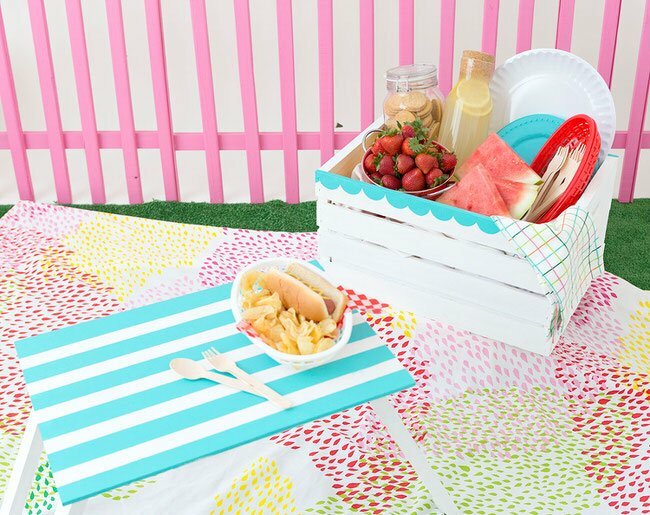 Because I just learned how to build a DIY wood crate picnic basket. This project is so cute, and the best part is that it also has a pop up tray table that travels right along with it. How freakin’ cool is this? From the very talented Amber at ‘Damask Love‘. Abby at ‘Sew Much Ado’ put together this DIY wood crate bookshelf tutorial, and it’s awesome. We especially love the birch tree wallpaper she used to back the bookshelves with. (Don’t worry, it just sticks on!) Also, she has the cutest little guy on the planet helping her out! Go check out her step by step photos. 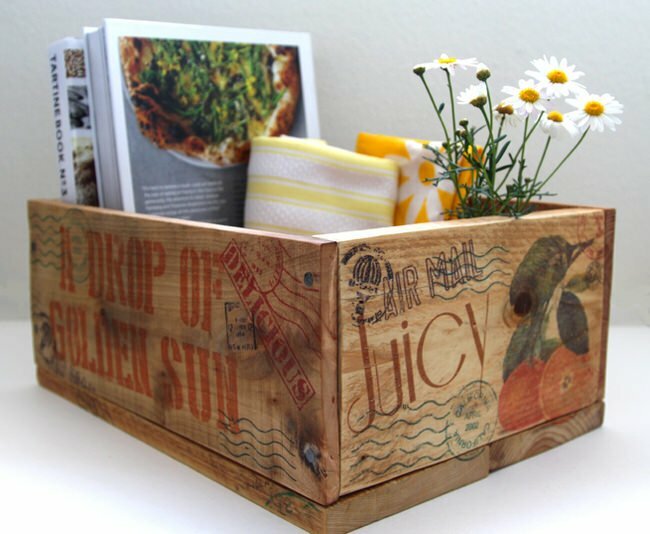 Want to make your own DIY wood crates? 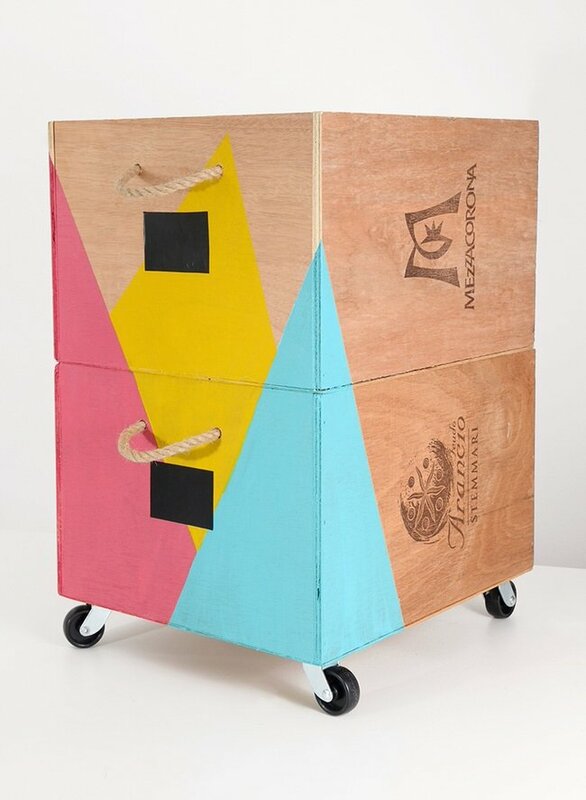 Then jump on over and visit Ananda at ‘A Piece of Rainbow‘ and find out how to make her homemade pallet crates and the image transfer to make them look authentic. Another perk? You can customize the size of these crates too, and they are made of cheap or free pallets! Finally, for all of you who feel like this is all just a little too much trouble (who are you kidding?) there is always the option of letting someone else do the work. 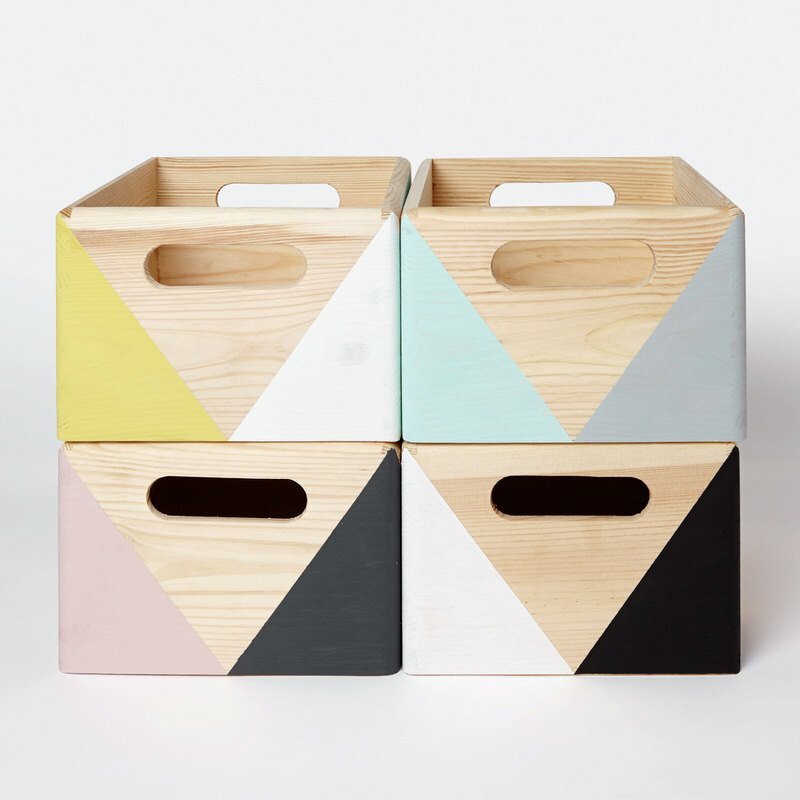 We love, love love these wooden storage boxes from ‘Happy Little Folks‘ on Etsy. Which DIY wood projects will you choose? 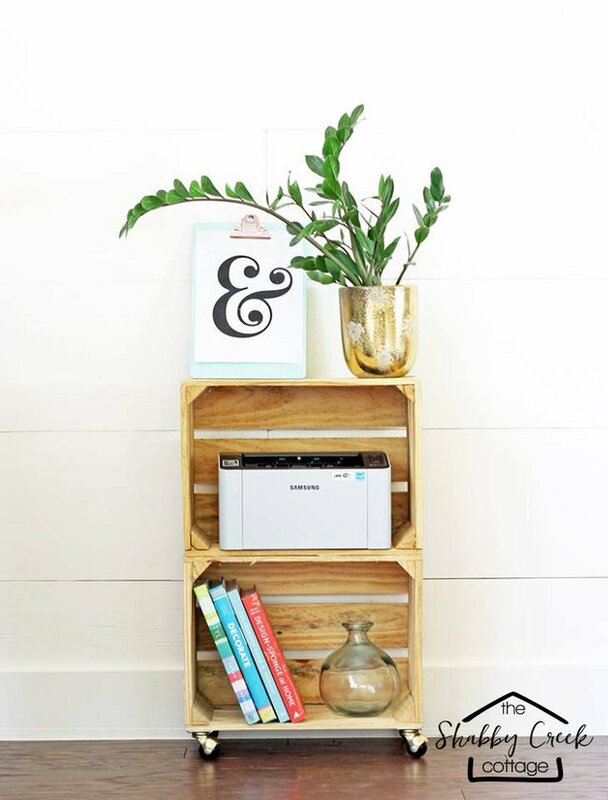 We hope you loved learning about all the things you can do with our post on DIY Wood Crate Projects! 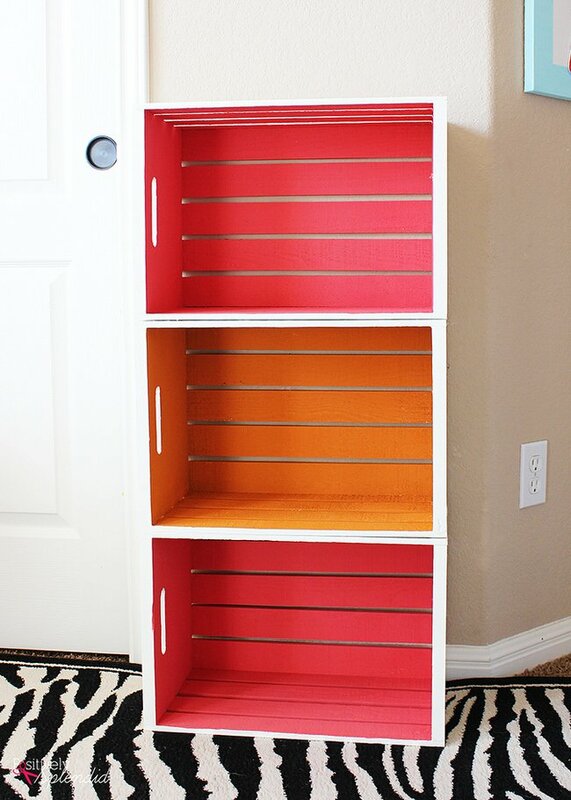 Now jump on over to check out our posts on Hide the Ugly- Outdoor Eyesores or DIY Dresser Makeovers!